1. Fully digital temperature and time control, LCD displays show the temperature and time. 2. The special thickened heating plate effectively guarantee the even and stable teperature. 6. The pressure can be adjust easily. 7. The silicon pad can endure maximum 350 degree without any distortion. 9. 70° open of heating plate, convenient for operation very much. upgraded and thickened aluminum plates make it safer and avoid troubles of uneven base board and carrying capacity. The upgrade of quality, material and technology further enhances the quality. 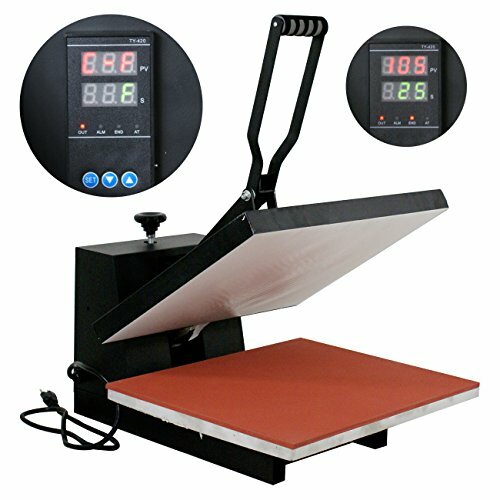 It can be lifted, lowered and rotated by 360 degrees, which makes putting and taking printing articles easier as well as replacement of different transfer parts.